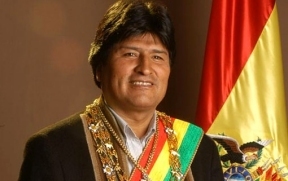 He has ruled Bolivia for ten years. Current Bolivian President Evo Morales and a huge entourage of indigenous Aymara and Quechua Amerindians held a large celebration in La Paz, Bolivia, in honor of Morales having been the ruler of Bolivia for a decade. Even with all of the controversies surrounding Morales, he remains a popular ruler in Bolivia—especially among the indigenous peoples who are the majority of the population and have always been so. Before Morales, Bolivia had been ruled by its white European minority and mestizos before the indigenous majority gained the upper hand in finally electing an indigenous president. Through Morales’ Movement for Socialism party, Morales and his indigenous allies have been able to stay in power for ten years, and have had success in funding widespread programs for the indigenous through the sales of oil and other natural resources. But this has all come at a price………curtailment of freedom of speech, the right to peacefully assemble, and what is now coming term limits on the presidency. Like in Venezuela, President Morales has now proposed that term limits be lifted for those serving in the highest office. If Morales gets his way, and he may do so, he may remain president in Bolivia until 2025. The chances are high he will get his way. Bolivia is experiencing 5.1 percent GDP growth—the only country in South America with such growth. The programs helping the country’s indigenous peoples has swung loyal support to Morales and his Movement for Socialism. But it will come at a price. Any person who can be elected and serve in office indefinitely can assemble virtually unlimited power in his/her hands. This is what happened in Venezuela exactly, and why a growing number of Venezuelans now want current Venezuelan President Nicolas Maduro to resign. Things may have worked under former Venezuelan President Hugo Chavez, but the Venezuelan economy has tanked, there are severe food and consumer goods shortages, a rampant crime and homicide rate, and political instability. A growing number of Venezuelans want Maduro out, but because the president is unaccountable, a newly elected opposition Venezuelan Congress may have to force through an impeachment vote to get him out. This could indeed be the future of Morales—a president held unaccountable for his actions, and who presides over his country with virtually unlimited power. A clear dictator in the making. He can be “voted” in, but not voted out. This is a challenge not only for Bolivia, but for all of the Americas. A person, no matter how popular, must never be allowed to serve in the highest office indefinitely.